President Trump on Friday announced that he has canceled plans for a military parade in Washington, DC, on Veterans’ Day over the “ridiculously high” price tag the city quoted the administration. "The local politicians who run Washington, D.C. (poorly) know a windfall when they see it. When asked to give us a price for holding a great celebratory military parade, they wanted a number so ridiculously high that I cancelled it. Never let someone hold you up! I will instead attend the big parade already scheduled at Andrews Air Force Base on a different date, & go to the Paris parade, celebrating the end of the War, on November 11th," Trump wrote. "Maybe we will do something next year in D.C. when the cost comes WAY DOWN," he continued. "Now we can buy some more jet fighters!" 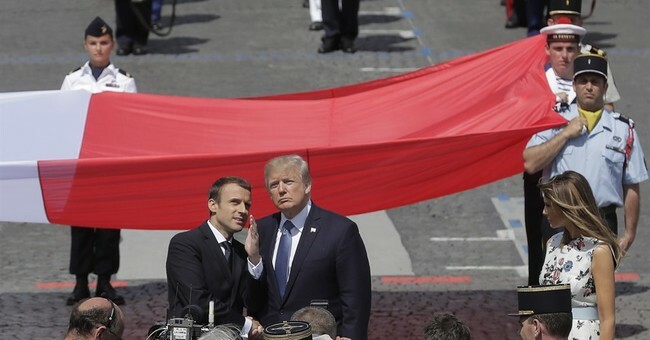 President Trump was first drawn to the idea of having a military parade in the U.S. after attending France’s Bastille Day celebration last year in Paris with French President Emmanuel Macron. His decision to cancel the parade comes one day after the Pentagon raised the estimated cost of holding a parade to $92 million, a drastically higher figure than previous estimates. Despite the change in plans, Trump was still lashing out at his critics late Thursday, such as Democratic Sen. Richard Blumenthal, who said the president should instead use the money to help veterans. “Real patriotism should mean $92 million to honor military service & benefit veterans, not glorify politicians. Improve vets health care, more jobs & skills, end vet homelessness & suicides — still killing at least 20 heroes every day,” Blumenthal tweeted. “How can “Senator” Richard Blumenthal, who went around for twenty years as a Connecticut politician bragging that he was a great Marine war hero in Vietnam (then got caught and sobbingly admitted he was neither a Marine nor ever in Vietnam), pass judgement on anyone? Loser!” Trump said.